When your drains clog up, it’s easy to feel frustrated or overwhelmed. 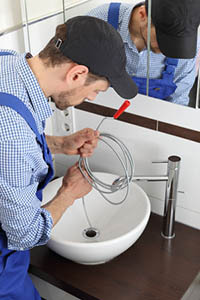 After all, fixing a clogged drain can be a lot of work, and most homeowners don’t have that kind of time on their hands. If you need help with drain cleaning in Azle, TX, call in your friendly experts from Lightfoot. We’ll get to you fast, assess your drains, and come up with the best way to get everything flowing freely again soon. If you just have one stubborn clog, we’ll probably use a professional-grade plumbing snake to work on it. Our plumbers in Azle TX all come with this equipment on their trucks, so you won’t have to wait. We’ll use the snake to remove your clog or break it up so it can flow down your pipes. If you have a couple of clogs in one area of your house, we’ll look deeper in your system for the clog. We may still be able to remove it with the snake, or we may have to remove a section of pipe and replace it. Either way, we’ll get the job done as soon as we can so you can get your life back to normal. If you need drain cleaning in Azle, TX throughout your home, we’ll look for the source of the problem in your sewer line. A tiny camera on a flexible cable allows us to find the clog, determine what it is made of and where it is located, and come up with the best possible solution for getting it out. No matter what type of drain cleaning in Azle, TX you need, we’ll make sure it gets done as quickly and efficiently as possible so you don’t have to worry anymore.